Shiver me timbers! 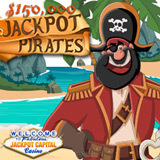 Jackpot Capital Casino players are competing against each other for top bonuses in the $150,000 in Jackpot Pirates casino bonus event that begins this week and continues until June 25th. Frequent players can win up to $600 each every week. Even occasional players can win random draws for $5000 in prizes. Jackpot Capital Casino players earn points any time they play any of the hundreds of download or instant-play online games on their desktop or laptop computer, or in the mobile casino on their smartphone or tablet. They’re listed on a scoreboard according to their points ranking and every Monday $15,000 in casino bonuses are given to the top 300. Jackpot Capital Casino has hundreds of games from Realtime Gaming (RTG). Next week the new Purrfect Pet slot arrives with cuddly kittens and puppies and lots of free spins.